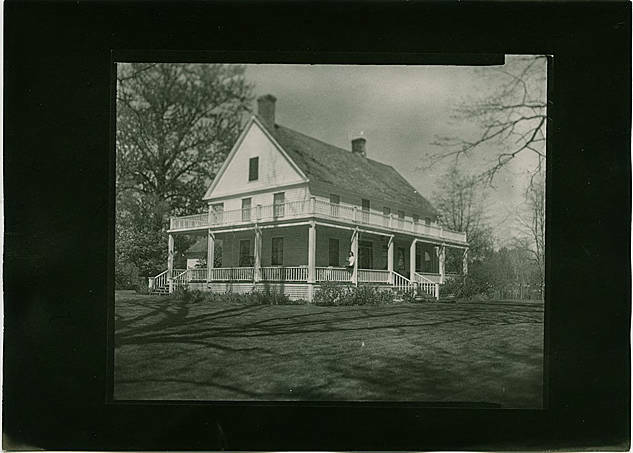 Black and white image of a large, three-story Classical revival style home with a large covered porch and balcony surrounding it set in a grassy area with trees in the background. A young woman with a child in her lap sits on the porch railing, possibly Lillie and Harold Harding, daughter and grandson of the Sweeks. John and Maria Sweek built the original portion of the house in the late 1850s, after arriving in Washington County and taking up a Donation Land Claim. The house has been listed on the National Register of Historic Places since 1974. The current city of Tualatin sits on land donated by the Sweeks from their original land claim.